This dessert, named after a ballerina, is elegant and divine. Takes a while to put together, but well worth the effort. Remove the bowl from the mixer, then sift the cornstarch onto the beaten egg whites, add the vinegar and vanilla, and fold in lightly with a rubber spatula. Pile the meringue into the middle of the circle on the parchment paper and smooth it within the circle, making a rough disk. Bake for 90 minutes. Turn off the oven, keep the door closed, and allow the meringue to cool completely in the oven, about 1 hour. It will be crisp on the outside and soft on the inside. Invert the meringue disk onto a plate and spread the top completely with Sweetened Whipped Cream. Combine the strawberries, blueberries, and raspberries in a bowl and toss with about 1/2 cup of Triple Raspberry Sauce, or enough to coat the berries lightly. 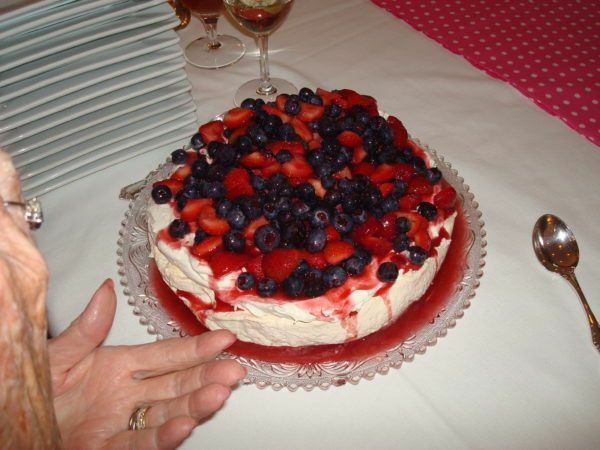 Spoon the berries carefully into the middle of the Pavlova, leaving a border of cream and meringue. Serve in large scoops with extra raspberry sauce on the side.